Port-au-Prince (/ˌpɔrtoʊˈprɪns/; French pronunciation: ​[pɔʁopʁɛ̃s]; Haitian Creole: Pòtoprens) is the capital and largest city of the Caribbean country of Haiti. The city’s population was estimated at 1,897,859 in 2015 with the metropolitan area (aire métropolitaine) estimated at a population of 3,296,386. The metropolitan area is defined by the IHSI as including the communes of Port-au-Prince, Delmas, Cite Soleil, Tabarre, Carrefour, and Pétionville. 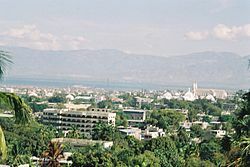 The city of Port-au-Prince is on the Gulf of Gonâve: the bay on which the city lies, which acts as a natural harbor, has sustained economic activity since the civilizations of the Arawaks. It was first incorporated under the colonial rule of the French, in 1749. The city’s layout is similar to that of an amphitheatre; commercial districts are near the water, while residential neighborhoods are located on the hills above. Its population is difficult to ascertain due to the rapid growth of slums in the hillsides above the city; however, recent estimates place the metropolitan area’s population at around 3.7 million, nearly half of the country’s national population. Port-au-Prince was catastrophically affected by an earthquake on 12 January 2010, with large numbers of structures damaged or destroyed. Haiti’s government estimated the death toll to be 230,000.